← Reading Suggestions for the Board of Governors: Anything Else to Add to the List? Last Friday, members of the University of Alberta community squeezed into lecture hall 1-440 of the Centennial Centre for Interdisciplinary Studies to hear what Sebastian Thrun, the founder of one of the massive online open courses for-profit companies, Udacity, had to say about the “innovation” that commentators have been insisting for many months will so radically “disrupt” higher education as we know it as to make it unrecognizable. After he’d warmed the crowd up with a few laughs and video footage of students offering their testimonials about the impact of his MOOC (with the longest piece delivered awkwardly, as if the speaker were reading from a teleprompter), Thrun launched into his pitch proper, which asked faculty in the audience to look to themselves to extricate universities from a state of crisis. The appeal was partly to our altruism, partly to our narcissism. The argument ran as follows. Universities are failing. As it stands, most of them offer an education that is often “of dubious quality,” for a cost that is too high, with degrees themselves no longer of much “utility.” Student debt is crushing. At $1.3 trillion dollars, the collective debt of post-secondary students in the United States greatly exceeds the total debt from mortgages. It also exceeds accumulated credit card debt. Some are calling this the education bubble. Thrun himself believes the bubble is about to burst. How could the entire professoriate not want to align itself with such a goal, especially when the vision includes the opportunity to meet thousands of students worldwide at Global Meet-Ups to which students will throng to express their adulation? But the vision as presented on Friday mystified something crucial: where the money to drive it forward will come from, and whether it is to come in the form of capital or gift. Is it to come from people who want to profit off the current situation? Or as a matter of a just distribution of public funds for the global common good? Let’s leave that aside for the moment, and think about the math. The slide that hovered above us all at the presentation with its iconic $1 suggested that the capital required was so inconsequential that we needn’t trouble our heads about it, but the $1 per student per course to effect this vision needs to come from somewhere. Even if we work with the conservative estimate that any given MOOC is designed to secure a student-body of at least 200,000 students, every course requires an initial investment of at least $200,000. And presumably any institution that wants to offer MOOCs will want to offer not one but several. This would require an initial investment of a figure somewhere between $1.5 and $2 million, depending on how many students each MOOC was aiming to secure. Perhaps the University of Alberta’s investment will be far more modest. Either way, you say, the figure is peanuts for our contribution to such a magnificent vision? Many might very well agree. But it’s not easy for the University to find $1.5 million dollars. And even if it were the proposition before us would still involve pressing resource allocation issues. As the Dean of Arts noted in her State of the Faculty address last week, even after the cuts through which the Faculty was put in 2009-2010, last year, and this — the last, a target that we could only meet “through a reduction of 9.67 vacated (or soon to be vacated) tenure-stream positions”— it is anticipated that the Faculty will need to cut yet another $1.5 million from its budget for 2013/2014. The Dean described the current round of cuts required of the Faculty as the “sword of Damocles” that is hanging over our heads. Yet just days later we hear that members of another are being urged to put themselves forward to become UAlberta MOOC Rock Stars in a project that will secure “hundreds of thousands” even “millions” of people for our courses at an undeclared cost. Where exactly do MOOCs fit into the University’s immediate and projected business plans? And how do other faculties, and the Faculty of Arts in particular, fit into these plans? (As Dean Cormack noted in her State of the Faculty Address, what we do in the Arts isn’t a “frill” for culture; it is essential.) Where are the resources to fund the MOOCs in Science to come from, and how will this allocation of resources serve the institution as a whole? And if we are truly engaging in the creation of MOOCs for altruistic purposes — to do our bit in bringing higher education to the world for free — how do we resolve this with the fact that it is the founder of a for-profit company who puts this vision before us with the claim that our choice will somehow save us from financial crisis? 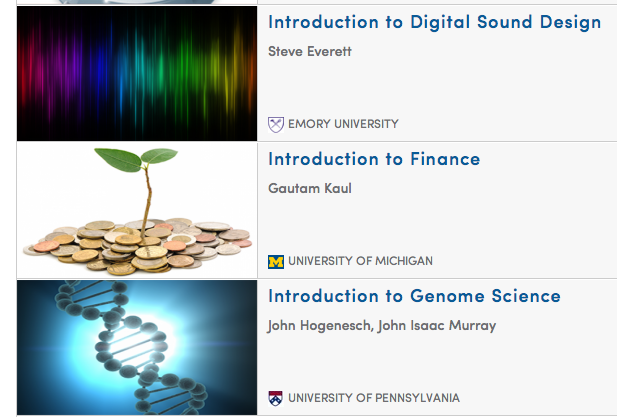 Snapshot selection of courses currently being offered by Coursera. See their full offerings at https://www.coursera.org/courses. If the money is to be put forward with the expectation that as a result of our MOOCs more students will want to come to the University of Alberta, how do we deal with the difficulty that our MOOCing will see us competing for students in a growing market of MOOCs filled with MOOCs from the world’s most prestigious universities being offered by Udacity’s principal competitor, Coursera? As it stands, Coursera is offering MOOCs created by professors at universities such as Harvard, Stanford, and the University of Pennsylvania. Last week, UBC joined them. What are the differences between Udacity and Coursera? And what does it mean for us to accept Thrun’s claim that universities are in their current state of crisis because of a lack of “oversight”? A good many commentators are indeed arguing that over the last quarter-century North American universities haven’t been managed properly. But to attribute their failure to a lack of “oversight” is to distract us from the more deeply-rooted cause: the devastation that North American universities have experienced over the last twenty-five years stems directly from radical decreases in public funding. And so we have something of an irony before us: the situation we are in has resulted from decades of underfunding of post-secondary education at public institutions, and Thrun would save us from the results without having properly identified the cause. Any solution to a problem that doesn’t correctly identify its cause threatens to falter from its inception, and it is likely to do so here unless an understanding of the larger problem informs how the funding for each institution’s participation in this global venture is structured. Thrun mentioned governmental spending on post-secondary educations on Friday, but only in a negative way: governments are throwing their money, he claims, at for profit companies — the wrong for-profit companies; for-profit companies other than his own. Thrun is of course talking about an American phenomenon about which we would need to turn to American higher-education analysts for full perspective. But Thrun would have us accept that the crisis of the American university is our crisis, and he attempted to support his view with a quick statement about the decline in rankings at Canadian universities. The blanket claim makes no sense, given that Canadian universities — most notably, the University of British Columbia — have been surging ahead in world rankings. Inasmuch as the claim does apply to the University of Alberta’s situation (the latest world rankings are here), we are more vulnerable to the argument of Crisis than other Canadian institutions might be, and hence more vulnerable to Thrun’s contention that there is only one response to it. But when we remember the larger context — the American situation is not our own, and the University of Alberta has amongst the highest public funding of public universities in North America, funding that we need to fight to sustain — surely we should be asking if our own solution might not be a different, more resourceful one from that being pursued by universities in the United States. A more resourceful solution shaped around the University of Alberta’s unique character and unique promise would balance our contribution to the global with a deep and abiding commitment to the local, and ensure that our role in all of this is one that strengthens our status as one of North America’s foremost public universities. As Siva Vaidhyanathan, Robertson Professor of Media Studies at the University of Virginia, suggested in his summer article for The Chronicle of Higher Education, “What’s the Matter with MOOCs?”, “If we would all just take a breath and map out the distance between current MOOCs and real education, we might be able to chart a path toward some outstanding improvements in pedagogical techniques.” But read pretty much any account of MOOCs that has appeared in the media in the last several months, and you will hear that what confronts us is a tsunami. The metaphor appears to have originated with Stanford University president John Hennessy, in an interview with the New Yorker last April, and was put into further circulation by David Brooks in the New York Times. Hennessy’s use hinted at the dangers; Brooks however assured his readers that the “Campus Tsunami” was not to be feared. 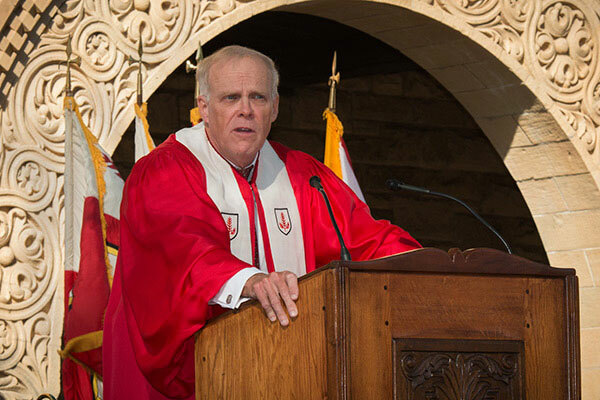 Stanford University President John Hennessy at Welcome Address, 19 September 2012. 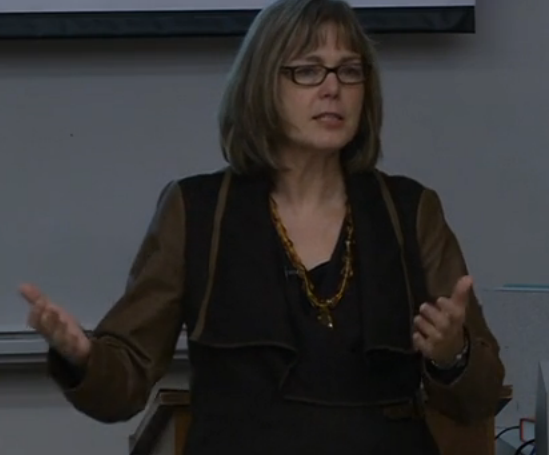 Hennessy urged students to study subjects that reflected their passions rather than their anticipated choice of future career. Oxford English Dictionary, tsunami, n. A brief series of long, high undulations on the surface of the sea caused by an earthquake or similar underwater disturbance. These travel at great speed and often with sufficient force to inundate the land. 1897 L. Hearn Gleanings in Buddha-Fields i. 24 ‘Tsunami!’ shrieked the people; and then all shrieks and all sounds and all power to hear sounds were annihilated by a nameless shock . . . as the colossal swell smote the shore with a weight that sent a shudder through the hills. If we take the metaphor seriously, universities that wish to get on the “upside” of this “experiment” may need to participate in a force that smites others and sweeps them off the planet to leave only 10 institutions of higher learning standing. Although he did not say this on Friday, Thrun’s formula seems to be that for the proposition that he puts before us to be financially feasible — for free post-secondary education to be brought to millions of people around the planet who would otherwise have no access to any such education — the number of institutions offering that education must decrease. To put it more bluntly, in a way that accords with his statement to Wired Magazine in the spring, the number of the educated will grow; the number of those doing the educating will shrink. How can this vision not trouble us? What are the consequences of it for the Academy, which is surely at its most vibrant, and its healthiest, the more people that it has doing the work of thinking, researching, and teaching for the common good? Are we really to participate in a death match for the survival of the fittest? On the basis that we have no choice? Thrun tells us that we must participate in this because one “bubble” is bursting, but don’t we need to take care that in our haste we do not simply create the next bubble, one with potentially more devastating consequences? Last, but hardly least, Thrun’s talk raised pedagogical questions. The most interesting aspect of Thrun’s presentation on Friday involved talk about the videogame Angry Birds, which anyone who spends any time with the under-7 crowd knows well. 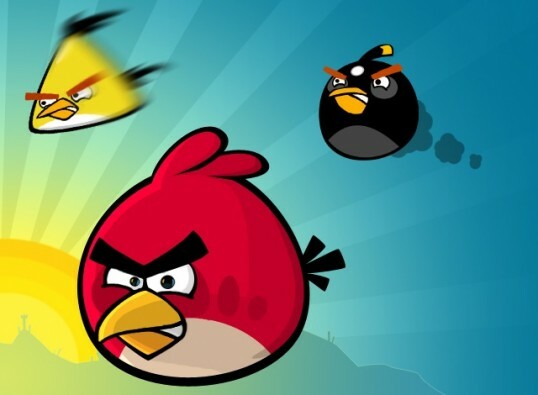 Angry Birds is a terrific example, he suggested, of an educational form of play, for the game takes its players through a “series of complex physical scenarios” through which they learn physics simply by playing the game. The only flaw with Angry Birds, he suggested, is that you can’t get a Ph.D. in physics by playing it. We seemed on the verge of one or another exciting proposition: the claim, possibly, that MOOCs are the way to share via the Internet innovative forms of thought that exploit new technology to create modes of play with a powerful iterative aspect; the engagement in complex thought offered through a form of play makes students playful creators who will in turn generate innovative forms of thought, and so on. But, no, we were given instead a chart that showed us that Thrun hopes MOOCs will make it possible for us all to keep learning across our working lives — an admirable goal, but hardly a revolutionary one. Manipulating variables until you produce the “right answer” may be a form of thought, but it is certainly not a way of thinking promoted or cultivated by the Humanities; and the idea of teaching as the “programming” of students certainly doesn’t accord with humanist conceptions of education that empowers. Thrun’s delight in his example underscores just how inapplicable to certain fields MOOCs may be, at least in the forms in which they are currently being imagined and promoted. Not Whether to MOOC, But How: Is that the Question? Perhaps faculty at the University of Alberta do wish to support the creation of MOOCs. Perhaps they do think that MOOCs are the way to ensure the long-term health of the University. But there are choices to be made here — choices involving the allocation of resources, and pedagogical imperatives, as well as the larger vision not only of this University but the Academy in general — and faculty need the opportunity to engage with these as an intellectual matter. Let’s hear the institutional vision in which the move toward MOOCing at the University of Alberta is to be justified, and let’s deal fully with the many issues that arise in relation to the prospect — which include equity issues. Who will decide what courses are MOOCable, and by extension which faculty members get the opportunity to MOOC? How will these decisions affect the allocation of resources in and across faculties, including decisions about which faculties get to benefit from the creation of new faculty lines? 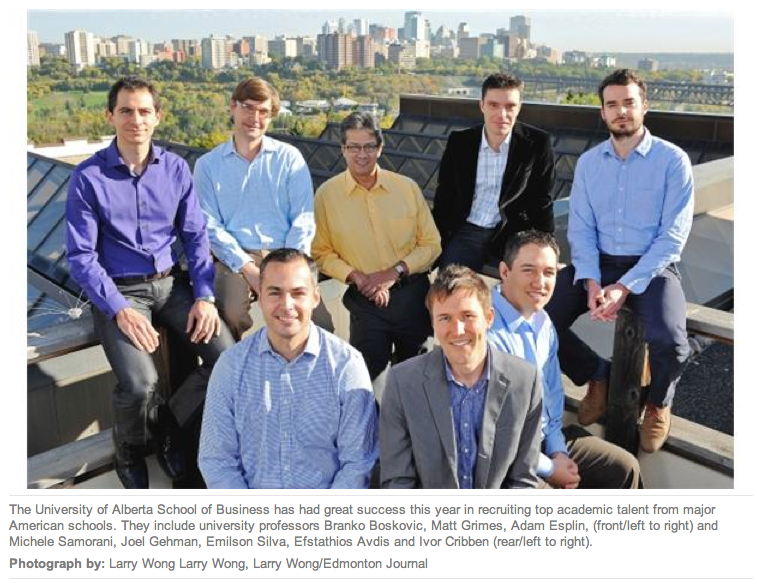 Welcome to the eight new faculty members in Business showcased in Friday’s article in the Edmonton Journal. Please join us in debating the various questions that the possibility of introducing MOOCs at the University of Alberta generates. And hopefully faculty in Education will want to drive forward this discussion, joining sociologists, political scientists, and others with the relevant expertise in Arts to debate (amongst other things) the feminist implications of the pedagogical model that we are being offered. Perhaps the President is already planning a forum in which these matters can be taken up. Let’s urge one, shall we? How about a formal debate between Thrun and another promoter of MOOCs — Daphne Koller of Coursera, perhaps — and two critics of MOOCs who can bring their intellectual expertise in pedagogical innovation to bear upon the issue? On Friday, Thrun made a point of declaring that he himself has never been taught how to teach, and does not have the time to attend conferences in which specialists in Education present their work. Let’s hear from such specialists. Complex issues that involve the introduction of a form that proposes to transform higher education as we know it should be publicly debated, as an urgent matter of collegial governance. The hosting of such a forum would be a wonderful way for the University to demonstrate how it can contribute to the shaping of this all-important development in higher education not as a follower but as a leader — a leader keen to nurture all units of the University even as it creates its MOOC rock stars. Finally, if we are truly participating in a project whose central goal is to bring higher education to the world for free, what are we going to do to ensure the comprehensiveness of this vision? The vision depends upon there being a computer in everyone’s hands. But as Hans Rosling, Professor of International Health at Sweden’s Karolinska Institutet, noted this afternoon (24 September 2012) in his presentation at the Social Good Summit in New York City, there are currently one billion people on the planet who have no access whatsoever to contemporary technology. For us to have any hope of achieving the vision that Thrun presented on Friday, we need radically to alter access to and distribution of resources on this planet. This entry was posted in massive open online courses (MOOCs), the north american academy and tagged angry birds, coursera, hans rosling, higher education "bubble", john hennessy stanford, jonathan schaeffer, ken auletta new yorker, massive open online courses, moocs, province of alberta funding of post-secondary education, richard demillo georgia tech, sebastian thrun, siva vaidhyanathan, social good summit maskable 2012, stanford university, student debt, student debt protests montreal, tsunami, udacity, un covenant on social economic and cultural rights, universities in crisis, university of alberta, university of alberta faculty of arts, university of alberta faculty of science, university of alberta school of business administration, university of british columbia, wired magazine. Bookmark the permalink. These are the “open secrets” of power and small thought. The very dark logic of things called “necessary” creeps along. Socially, we seem to go backwards more than 60 years. I wish I’d attended Thrun’s talk. It seems to me he has some utopian realist pretensions that he might need to attend to more critically. For example, it’s undoubtedly true that one can learn a physics of a sort from Angry Birds. But it’s important to consider whether that education can then be applied in the real world. Imagine the disillusionment with your education you might experience if you needed to squish a pig hiding in a shack, and so you take your bird and put it in your slingshot, and gauge your distance and force, and take careful aim at the point of the shack you know to be weakest, but when you release the bird/projectile, the bird doesn’t knock the shack over, and the upper parts of the structure don’t collapse on the pigs underneath! Turns out the edifice (as creaky as it is) is still too strong to break with symbolic platitudes like the “empowerment” that comes from watching videos on the internet. I suspect manipulating variables to get the “right” or “real-world-useful” answer is more complicated than even Thrun claims, as he presents these fancy, inclusive new forms of thought, not to mention business models, with all architectural expertise of Tetris.